When Tasks Involve Shock & Vibration, Select Gloves with Vibration-Dampening Polymer Palms! When selecting gloves to use on a job, a worker has to consider the following specifications first. Hands must be kept warm. It is very important to keep your hands warm when working with tools that vibrate. Good circulation is a must to prevent HAVS (hand-arm vibration syndrome). HAVS is the medical term for symptoms in the fingers, hands and arms caused by using vibrating tools. HAVS is a widespread recognized industrial disease affecting tens of thousands of workers and it's estimated that 1 in 10 people who work with vibrating tools or machinery will develop this disorder. Tingling and/or numbness in the hands and fingers. As the symptoms progress, they become irreversible and simple tasks like pouring a glass of water become difficult. Gloves must fit well. The glove chosen must not impede the worker. It must be roomy enough for movement and not fit too tight, cutting off the proper circulation needed to withstand vibrations. When a worker has prolonged exposure to vibration, they are susceptible to getting HAVS. This is a serious medical condition that is irreversible once it has set in. HAVS may occur in the fingertips, hands and arms when working with vibrating tools or machinery over a long period of time without frequent breaks. 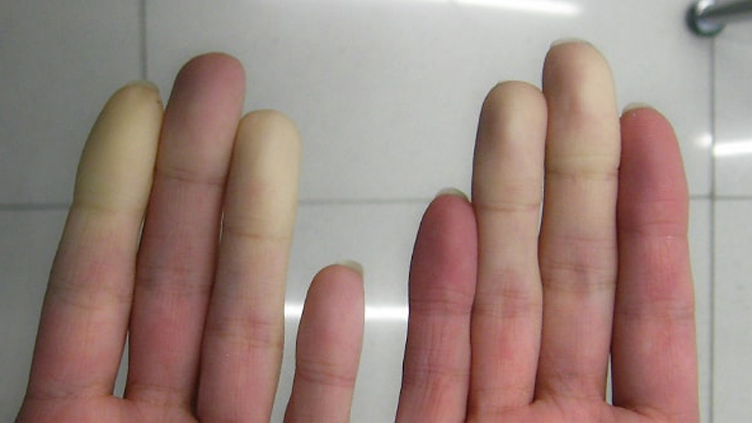 The blood vessels in the fingers begin to collapse, skin and muscle tissue won’t receive enough oxygen and the tissue eventually dies. It can also cause gangrene where the skin turns black and the extremities must be amputated. Testing the vibration levels of the tools being used is an advisable way to determine how many Hz are coursing through the body and finding the proper glove to wear. Featured below are four popular styles of vibration dampening industrial work gloves from Superior Glove® - one of North America's leading manufacturers and suppliers of industrial work safety gloves. A respected source for thousands of customers, Superior Glove® has been in the glove business since 1910. #VIBGHFV Vibrastop™ Goatskin Leather Half-Finger Gloves are a good choice for those who use pneumatic tools on a regular basis. These provide a padded layer inside the glove with a 60 gram vibration-dampening polymer layer. They are made from soft goatskin leather giving them plenty of room to move as needed. 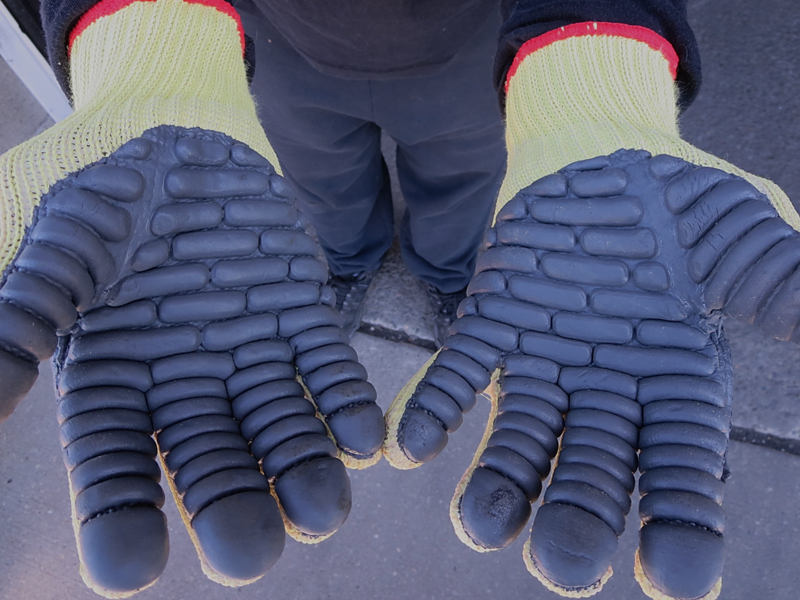 Although they are fingerless, these gloves still have the same aspects as full glove vibration reduction requirements. #S10VIB Vibrastop™ Full Finger Coated Knit Gloves offer both comfort and flexibility while providing a padded layer of vibration-dampening polymer for repetitive impact work. These have a specially formed cholorprene coating on the fingers and palms with elastic wrists to prevent loose items from entering the glove. They help ease tingling in the fingers after using tools for an entire work day. #66BRVIB Vibrastop™ Leather Fitters Gloves offer a layer of vibration dampening polymer in the palm, a red safety cuff and a double thumb patch. These are roomy and ready for work with vibrating tools and machinery. #378FRV Endura® Goat-Grain Shipwright Gloves are Flame-Retardant and are ASTM ANSI Rated against heat, cuts and punctures. Treated with oil and water repelling Oilbloc™, they feature 4mm of FR anti-vibration palm padding and a custom fit cuff.